Five on Friday: Warm Wishes! Hey! It's Friday! I have the sniffles today, and I'm rocking a top knot and a cozy sweater at work. You know, basic last Friday before Christmas activities. Enjoy! Look at these cutie little gifts I made for my co-workers! I like to give them all a little something at this time of year as a token of the season. Last year I made brown sugar scrubs, but this year I thought I'd go the edible route. I saw these hot chocolate jars with marshmallows and Baileys on Life is Poppin'. Missi created a great round up of easy DIY gifts that take less than 30 minutes to make--perfect for co-worker gifts in my opinion. I decided to leave out the Bailey's only in the interest of keeping the cost low. All ready to be handed out! We have been having yoyo weather here in coastal Virginia. It was in the 60s yesterday, and today it is in the 30s. This is making it weird to know what to wear, and everyone is sick. Also, no snow. It has pretty much been that way since we moved here, and I liked it at first. But this year I really just can't get into the Christmas spirit, and I think part of it has to do with the snow. Would it be weird if my Christmas wish was for a few flakes? I am pretty much done with my Christmas shopping. I got so much done online this year, that things have just been delivered to me in the mail slowly but surely. So easy. I feel like this is a major victory, that I am so close to being done. I only need one thing more for Dave, which I am picking up tomorrow morning, and will then promptly wrap. Also, for some reason, I couldn't find our decorations box in our storage closet. I feel like I still did pretty well on the decoration front, with the dollar store/walmart budget I put on myself. Sometime this week I will put up some photos. 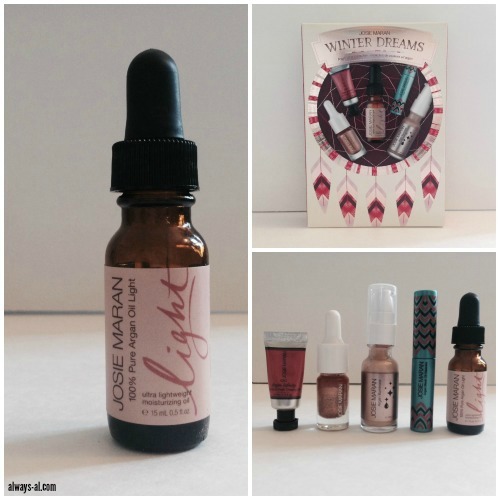 I received the Josie Maran Winter Dreams Argan Color Collection for my birthday! This was on my wish list, and I was so excited when I opened it. I have been using the Argan Oil Light almost every day as a face moisturizer, and my skin has never looked better--especially around my eyes. This set is full of shimmery but subtle products, which is perfect for a natural, fresh face in winter. This set comes with a .5-oz of 100% Pure Argan Oil Light, a .17-oz. tube of Argan Black Oil Mascara, a .16-oz. tube of Argan Infinity Lip and Cheek Creamy Oil in Limitless Pink, a .16-oz. bottle of Coconut Watercolor Eye Shadow in Rio de Rose Gold, and a .15-oz. bottle of Argan Illuminizer. My favorite make-up products in the set are the mascara, and the watercolor eye shadow. The mascara feels and looks very natural, and still makes lashes thick and long. The eye shadow is a beautiful shimmery rose gold, and even though it took a little bit to figure out how to apply it. They aren't lying when they say a little goes a long way. I figured out that with most of these products, using my fingers was the best method of application. I will definitely need to get a picture this weekend when I have some of these products on! I want to write another post about what I read this fall, but I only read 2.5 books. They were the first two Game of Thrones books, which is why they took me so freaking long. I'm also in the middle of Lena Dunham's book, which I have to say, I'm really not impressed with at all. Maybe I will do a fall/winter combined recap post and then have more things to talk about. Do you have any good recommendations? Right now I have "Z: A Novel of Zelda Fitzgerald" by Therese Fowler queued up on Audible. Linking up with The Lauren Elizabeth and September Farm. Brown sugar scrubs are awesome, but going the edible route is never a disappointment for the holidays! The watercolor eye shadow from the set sounds fabulous! Everyone seemed to enjoy the mix as I passed it out! And the eye shadow is wonderful! I need to take a pic! Thank you for following! Enjoy your weekend! Love your coworker gifts! I bet it's delicious! And that Josie Maran collection looks awesome! I love giving jar gifts... was planning on making some myself but not sure if I will get them done yet or not.. Thanks, girl! The gifts were so easy! And the Josie Maran set is amazing! So worth it! Jar gifts are my favorite! I devoted an evening to making these. I think the key is to gather the supplies ahead of time, then do them all in one fell swoop! I just came back from a vacation and I am not done with my gifts yet. I like online orders. I will get my gifts in the mail for my family on Monday. I would like to wish you Happy Holidays. Jar gifts are wonderful Those large canning jars are one of my all time go to's for last minute gifts like the postman or people who drop by unexpectedly....Happy Holidays! That argan oil set looks amazing, I need to look into it. Your gifts for your coworkers are so cute! Homemade is always the best way to go, it is truly a labor of love! Glad you are pretty much done getting everything together for Christmas! I also want to read the Game of Thrones books! Those argan oil products look amazing! 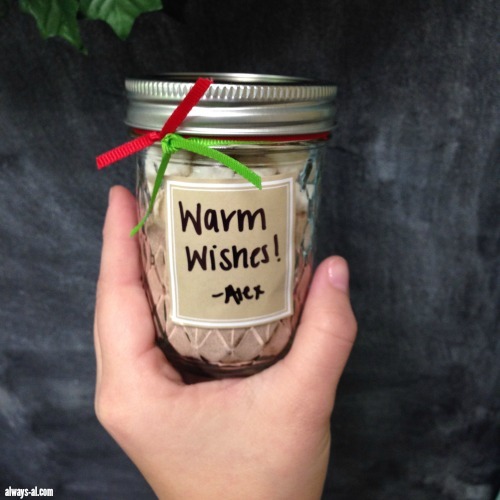 And I love your warm wishes jars...seems pretty easy to put together and something people will love! 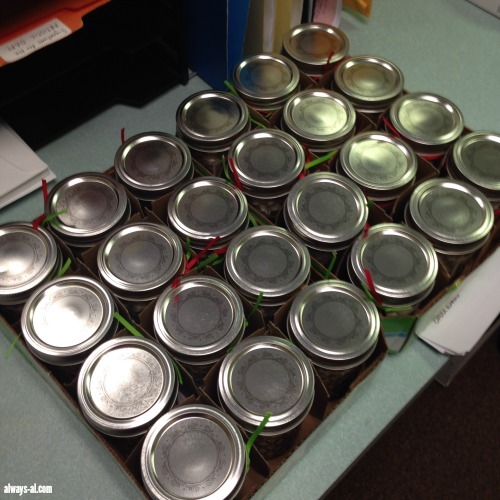 The kids and I made some jar gifts and we loved it. Super easy and a nice touch when you want to give something, but don't have a lot to spend. The jars are so cute! I love doing things like that for all of my coworkers and neighbors. I have read a couple of people who said the Lena Dunham book was very blah. I have also read that the Amy Poler book was awesome, its already in my stocking. Check that out! I agree, online shopping is so helpful in this busy time of year! I hope you and your family have a happy holiday! I love them! These are actually jam jars, so they are a little bit more compact. I thought about the large canning jars, to do a cookie mix or something, but chose these for their small size. Have a happy holiday! The oil set is amazing, it is definitely worth it. I'm so glad that I went the homemade route, they loved them! Have a happy holiday! Me too! Now I can (hopefully) relax for the next few days! They are good, but definitely a time commitment. Have a happy holiday! They were very easy and inexpensive! I love doing little things like that to lift people's moods. I hope you and your family have a happy holiday! Definitely! I also love them because they are very compact and portable. Thank you for visiting and have a happy holiday! I will check out Amy Pohler, thanks for the recommendation! I read Mindy Kalling and Tina Fey, and loved those (I actually laughed out loud at Tina Fey), so I thought I would like Lena Dunham. This might inspire a post about celebrity memoirs. Thank you for visiting!! Have a happy holiday!